Auto crop or Pan and Zoom photos to fit project ratio..
One of the great features of the iPhone 7 and iPhone 7 Plus is the camera with dual lens. It allows you to record videos continuously as long as you have storage space left. However, there are times when you want to cut off undesirable parts of the video or edit it before uploading the video to Instagram, Facebook or YouTube. And that’s why you are here. You want to know how to edit videos on iPhone 7/7 Plus. There are three ways in which you can edit videos on iPhone 7/7 Plus. If you are looking for an app that is more powerful and skillful, then I recommend Wondershare Filmora. It doesn’t just allow you to cut, trim and merge videos, but also provide you with lots of transitions, filters, intro, and outro effects, just to name a few. You can also add texts and subtitles, and music to your video footage. It is the best video editing software on the market that can help beginners create professional-looking videos. What's more, after finishing editing, you can upload your video to Facebook, YouTube or Vimeo directly to share with your friends and family members, or save it to your iPhone and Android phones, or burn it to DVD collection. Below are the steps on how to use Wondershare Filmora to edit videos on iPhone 7/7 Plus. Download Wondershare Filmora – The desktop app is available for both Windows and Mac desktop platforms. Make sure that you choose the right version for your computer. Connect your iPhone 7 to the desktop – The next step is to connect your iPhone 7/7 Plus with USB cable. Open Wondershare Filmora and select Create New Movie. 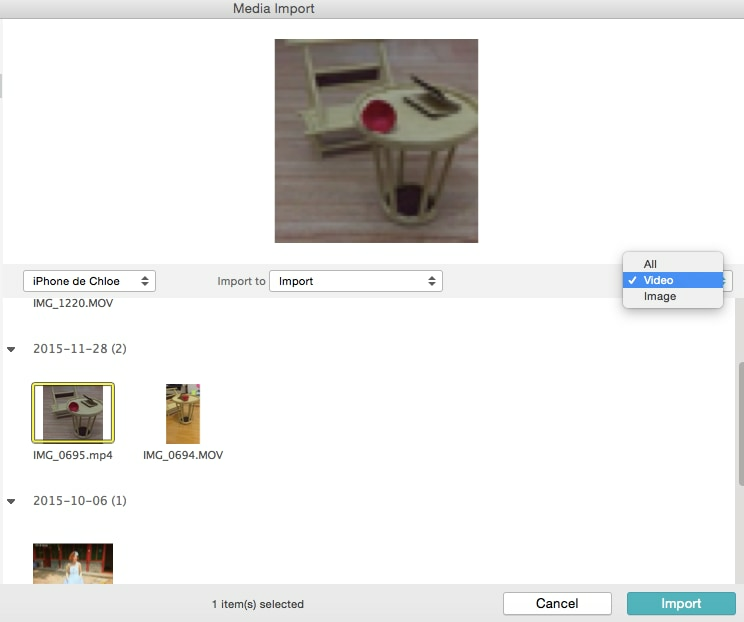 Then a Media Import window will automatically open. There you can import the videos straight into the desktop app. Find the video – Look for the video you want to edit. You can quickly find the video files through the dropdown menu found at the upper right corner of the window. Once you found the video, click on Import. Edit the video – Once the video is imported, you can start editing it by cropping, rotating and trimming the video. When you double click the video, you can adjust its saturation, contrast, hue, and speed. Aside from allowing you to edit videos on iPhone 7/7 Plus, the app also allows you to add text effect, filters, and transitions. It also has more advanced features that include Green Screen, Split Screen, PIP, Mosaic, Blur Face, and a lot more. Open the Photos App – Look for the icon of the Photos app and tap on it. There you will find all the photos and videos that you have taken with your iPhone 7/7 Plus. Locate the video you want to trim – The next step is to find the video that you want to trim or edit. Keep in mind that you can also edit other videos that you didn’t record using your iPhone as long it is saved in your smartphone. Tap the Edit icon – Then you tap on the Edit icon, and drag the left and right anchor to adjust the part that you want keep. Make sure that you get the anchors right or else you might trim the wrong part of the video. Tap Done – Once you have adjusted the anchors, tap on done. Then you can choose between Trim Original or Save as New Clip. When you opt for the second one, the original video will be preserved, and you will create a new file for the edited version. While it might be convenient to use the built-in app to edit videos on iPhone 7/7 plus, there are instances in which you want to do more than just trim the video. FilmoraGo for iOS is an easy-to-use app to take your normal, everyday videos into artist creations that will look like it cost hundreds of dollars to create. Just choose a video, select an overall theme and design for the video and add the music you like. It also provides basic video editing functions like trim, filters and transitions. Another great part is that, it automates your video, allowing you to just pick the best parts that you need and let the app do the rest. As you can see, there are several ways in which you can edit videos on iPhone 7/7 Plus. You can either use the built-in app, or Wondershare FilmoraGo or the WondershareFilmora on the desktop. The latter provides you with more control on how to edit the video. You will have a professional-looking clip in no time. Is you video portrait (upright)? If yes, then there will be some crop. Fortunately, we can crop it manually to get the best result. The video on my iPhone looks great, but when I export it from Filmora it turns to crap. I do have the full version and have exported with different settings. Any suggestions? Hi Liza, thank you for this helpful information on video editing. When using the editing function inbuilt in the iphone 7, can one edit various sections?